“Exceeds all expectations,” “nurturing,” “loves to teach,” and “nothing is too overwhelming”—that’s how Anastasia’s co-workers describe her. In December 2014, she served as medical commander at one of Knox County’s biggest mass casualty incidents. Two full school buses collided, killing three. Several of the patients were kindergarten age. Her leadership helped to ensure that every patient was sent to a hospital which could provide the level of care needed. She also made sure the uninjured were taken to a secure, comforting location. Called “our most accomplished paramedic field training officer,” every trainee she works with asks again and again for more shifts under her guidance. When Education Days approach, she is among the first to sign up to brief her colleagues, novice and veteran alike, about new equipment and tricks of the trade. At scenes with more than one patient, she often takes the worst injured, in part to spare her subordinates the stress that can come with working major trauma. 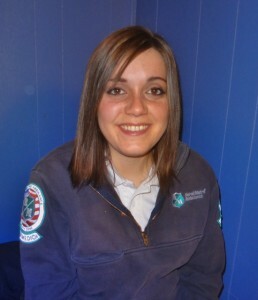 Anastasia provides excellent care for her patients and exceptional support for her teammates.